Jeep has six models in its lineup at present, and it brought six concepts to the 53rd Moab Easter Jeep Safari. But it didn't base one concept on each production model. Instead it focused all of its attention on the new Gladiator, leaving the Wrangler, Renegade, Compass, Cherokee, and Grand Cherokee out of the action at this year's rock-crawling festivities. Arguably the coolest of them isn't based on the new Gladiator, but on the old one: specifically a 1968 M-715 – the military-spec version of the original Gladiator, which Jeep reportedly bought off Craigslist for modification. Though its bodywork features a brushed-metal finish, all the steel has actually been replaced with fiberglass and carbon fiber. It also packs an upgraded suspension, interior, and wood-slatted, aluminum-sided, six-foot pickup bed. But the coolest part is what sits under the hood: Mopar's "Hellcrate” engine, the same 6.2-liter supercharged V8 as you'd find in the Dodge Challenger and Charger SRT Hellcat and the JGC SRT Trackhawk, but fitted with a vintage supercharger and mated to a three-speed automatic transmission. The Five-Quarter isn't the only two-door pickup with a six-foot bed, though, joined as it is by the bright blue J6 concept. 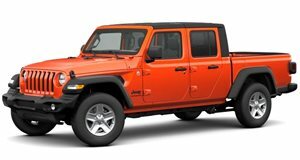 Cutting a similar but more modern profile, the J6 is actually based on a four-door Wrangler Unlimited but envisions the (admittedly unlikely) possibility of a two-door/long-bed Gladiator. The show truck packs the standard 3.6-liter Pentastar V6, but rides on a lifted suspension with a new set of beadlock wheels that could make their way, we hear, onto the options list. The remaining four show trucks are more directly based on the production Gladiator, but each take a unique aesthetic approach with their own list of fitted components. Like the relatively subdued army-green Wayout concept. It's based on the Rubicon and equipped for overlanding with a rooftop tent for two, 37-inch tires on 17-inch painted steel wheels, a snorkel air intake, and a 12,000-pound Warn winch. It'd take something that overt to make the Gladiator Gravity concept look subtle by comparison, with its bright orange paintjob. The Gravity is as open to the elements as can be, with a fabric roof, tubular structures replacing the doors, and fold/tie-down windscreen. And it's further equipped for venturing off the beaten path with 35-inch tires fitted to 17-inch wheels and a two-inch lifted suspension. Last but not least (at least for the retro-loving set) is the JT Scrambler, adopting the name we originally expected for the Jeep pickup and painted white with '80s-style red and orange stripes and similar off-road upgrades.